Welcome to longwalks.co.uk. 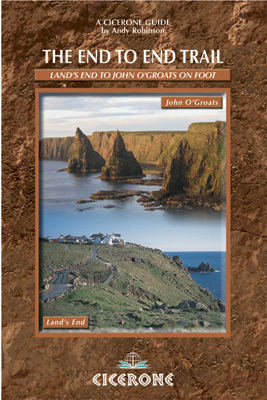 This website is about long distance walking in the UK, and in particular to make available additional information to support my book "The End to End Trail: Land's End to John O'Groats on Foot", published by Cicerone Press in March 2007. If you want to bookmark this site, bookmark this page - the others are likely to change their names and will result in broken links. I'll be adding more bits and pieces to this website from time to time: it already includes details of the Offa's Dyke Castles Alternative route (as promised in "The End to End Trail") and an expanded Land's End to John O'Groats bibliography. I'll also be putting updates and corrections to the book on here, so please let me know of anything you notice yourself. All the End to End books I know about are listed in the bibliography, but I'd like to plug one in particular that I've just read: Mark Moxon's "When I Walk, I Bounce" (Exposure Publishing, 2007). 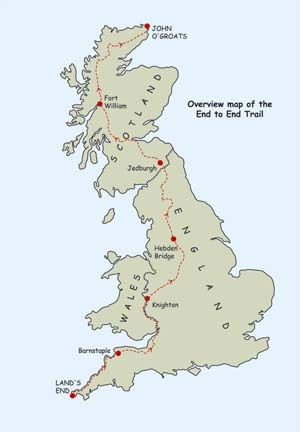 This is yet another account of a walk from Land's End to John O'Groats, but this one's well-written and funny, and gives a good feel for what it's really like on such a long trek. Highly recommended if you're planning an End to End walk, or even if you're not. Mark's also got his own End to End website, which is very comprehensive. Unless otherwise stated all material on this website (my website, not Mark's!) is the copyright of Andy Robinson and may not be copied without permission. You may make a copy for personal use of any of it, but none of it may be used for commercial purposes or published in any form (including on the web) without permission.